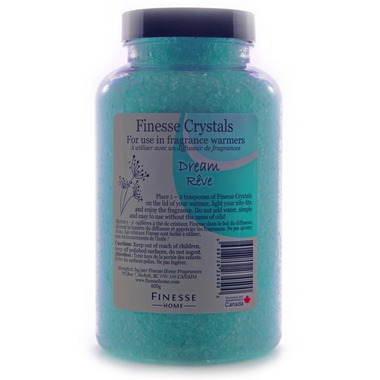 Finesse Crystals are the perfect way to diffuse fragrance into the home. These are designed to be used in the lids of diffusers, as they warm up they gently release their fragrance which are made using essential oils. Made with Finesse's Dream Essential oil blend of jasmine, vanilla, and bergamot pure essential oils to promote a calm and soothing night's sleep. Directions: Add 1-2 tsp of crystals to your plug in or candle diffuser. Replace as needed.